The AK4393 is a high performance stereo DAC for the 96kHz sampling mode of DAT, DVD including a 24bit digital Filter The AK4393 introduces the advanced multi-bit system for Modulator This new architecture achieves the wider dynamic range, while keeping much the same superior distortion characteristics as conventional Single-Bit way. 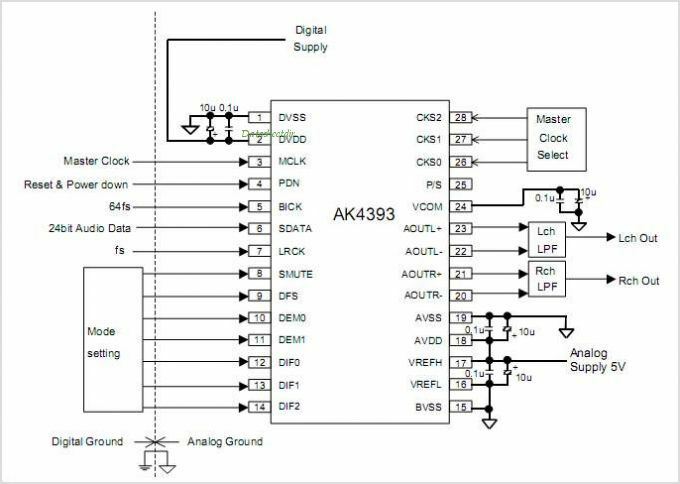 In the AK4393 the Analog outputs are filtered in the Analog domain by switched-capacitor Filter (SCF) with high tolerance to Clock jitter. The Analog outputs are full differential output, so the device is suitable for hi-end applications. The operating voltages support Analog 5V and digital 3.3V, so it is easy to I/F with 3.3V Logic IC. By AKM Semiconductor, Inc. 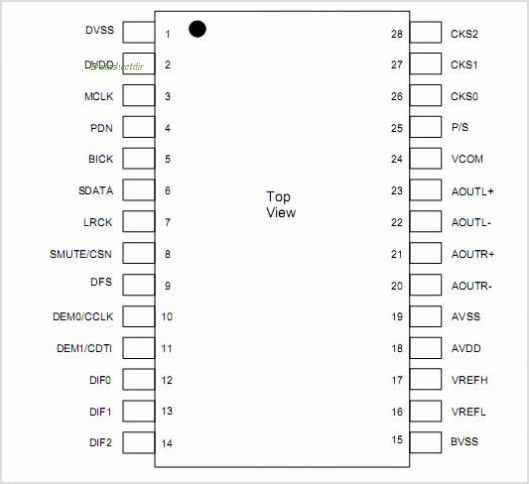 This is one package pinout of AK4393,If you need more pinouts please download AK4393's pdf datasheet. This is one application circuit of AK4393,If you need more circuits,please download AK4393's pdf datasheet.